Traditionally, the Passion narrative has taken excerpts from the Christian gospels to describe and reflect upon the final hours of the life of Jesus of Nazareth, his doubts in the Garden of Gethsemane, his trial, his public humiliation and torture, his crucifixion, his body’s disappearance from the tomb and the climactic miracle of his resurrection from the dead. Whilst this final event is one uniquely adhered to by believing Christians, much of the Passion in general – persecution of the innocent, malevolent authority exerting itself against ideas that threaten and challenge, the power of a peaceful, loving humility in the face of tyranny, the facing-down of fear – holds profound universal resonance for people of many faiths and those of none. 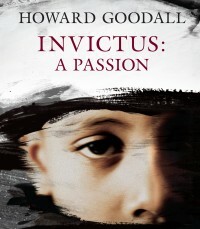 It is this universal meaning that my Invictus: A Passion hopes to address, so that, like my 2008 Eternal Light: A Requiem, it might find relevance with choirs and their audiences or congregations everywhere. Forty-five years of writing musical theatre has inevitably shaped the way I set narrative texts, encouraging me to avoid the abstract, opaque or overly elusive in meaning. Likewise I make no apology for my musical idiom being, I hope, approachable. The recurring messages of this collection – suffering, fortitude, compassion and survival against terrible odds are intended to challenge and comfort in equal measure. We live in a troubled era, one at times saturated with conflict, hazard and anger: I have tried to find a musical vocabulary for the piece which creates layers, therefore, without muddying understanding. Thus, when the music began emerging in my head I heard not a full, homogeneous string section but two quartets of soloists, acting, in choral terms, antiphonally. We would hear individual players, not a wash. A lone soprano saxophone, the nearest to my mind that a wind instrument gets to the sound of human keening, weaves amongst the voices, at times friendlessly isolated. Whilst the piano underpins the voices, particularly the soloists, as it might accompany an intimate song, the two horns’ role is to counter-balance the chorus, occasionally reinforcing but mostly acting in counterpoint to them. Against this relatively sparse, personal, almost baroque texture, the voices are paramount, allowing those of the authors and poets to speak directly and urgently to us. One aspect of the Passion story above all others guides the choice of texts in this piece and that is the role and perspective of women, in particular that of Jesus’ close friend Mary Magdalene, and his mother Mary. To draw this out, I have chosen mostly (though not exclusively) female poets writing in English between the 17th and 20th centuries. The central narrative thread, for example, normally taken from St John, St Luke or St Matthew’s gospels, are in this work taken from a verse version of the events written by Æmelia Lanyer née Bassano, called Salve Deus Rex Judæorum (Hail God, King of the Jews). This was printed in book form in 1611 (making it contemporaneous with Shakespeare’s ‘magical’ plays, The Winter’s Tale and The Tempest), and can claim to be one of, if not the earliest published in English by a female author. Lanyer is an extremely intriguing figure, a highly educated, respected woman, close to Elizabeth I and certainly known to William Shakespeare, a subject of enormous scholarly speculation as to whether she was the ‘Dark Lady’ alluded to in Shakespeare’s sonnets, or even – as some have proposed – the anonymous author of the First Folio plays herself. Recent scholarship has suggested that her family – the Bassanos, recruited in Venice to be musicians in Henry VIII’s court – were in fact ‘converted’ Jews (converted, that is, to avoid execution, originally in Catholic Spain). In any case, her telling of the Crucifixion story is remarkable in one important respect – it is a feminist critique of the events. Its sub-headings read, ‘Eve’s Apologie in defence of Women’, ‘The Teares of the Daughters of Jerusalem’ and ‘The Salutation and Sorrow of the Virgine Marie’. Emphasis is therefore placed, for instance, on Pontius Pilate’s wife begging for mercy for the prisoner, the injustice and pointless vengefulness of the court’s proceedings with its pompous, vainglorious bullies, or on the agony of ‘the two Marys’ at the Cross. Within the over-arching shape provided by excerpts from Æmelia Lanyer’s extended poem, movements are interspersed by other female authors: Gethsemane by Ella Wheeler Wilcox (1850-1919), Mary Magdalene and the Other Mary by Christina Georgina Rossetti (1830-1894), and Slave Auction by African-American author and abolitionist campaigner Frances Ellen Watkins Harper (1825-1911). This latter poem, which forms the basis of the 2nd movement, Lamentation, expresses the unbearable, unimaginable pain felt by a mother seeing her child torn away from her at a slave auction. To this harrowing account are appended the words of William Wilberforce, spoken in the House of Commons on 18th April 1791, “You may choose to look the other way but you can never say again that you did not know”. In the midst of appalling suffering, women so often must carry the burden of care, survival and loss. The 4th movement, Compassion, is inspired by the extraordinary story of Irena Sendler née Krzyżanowska, a Polish nurse and head of Żegota, the Polish Council to Aid Jews in the Second World War, whose personal interventions saved the lives of approximately 2,500 Jewish children in the Warsaw Ghetto, smuggling them to safety, acts of humanitarian bravery that eventually caused her arrest and torture by the Gestapo. She is honoured as Righteous Amongst the Nations at Yad Vashem, Jerusalem. The Latin texts of this movement are taken from the Book of Lamentations (“My eye hath run down with streams of water, for the destruction of the daughter of my people. My enemies have chased me and caught me like a bird, without cause…”) and from Psalm 142, the Old Testament being the meeting-point of Sendler’s Catholicism and the Jewish tradition of those whose lives she saved. For many, the greatest of all challenges to faith in the modern era has been the slaughter of innocents in successive genocides and both natural and man-made catastrophes. A 21st century Passion, therefore, cannot brush this question aside. Movement 7 reflects upon whether persistent human suffering is compatible with a loving, all-knowing deity, in a setting of A.E. Housman’s agnostic exhortation to the crucified Christ, Easter Hymn. As companion to Compassion, Movement 8, The Song of Mary Magdalene: Now we are they who weep, amalgamates Christina Rossetti’s poem imagining the women in vigil at the crucified Jesus’ tomb, with Isaac Watts’ 1707 hymn, When I survey the wondrous cross, acknowledging the grief of those left to mourn. Howard Goodall CBE, September 2017. Please contact Faber for more information.